The chapter has a conceptual character. 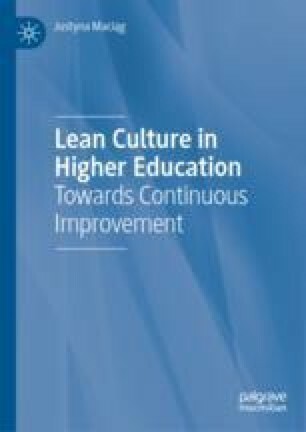 The author discusses issues related to organisational culture in HE, defines the notion of Lean Culture (LC) and approaches to research on LC, and describes the external context for the shaping of a mature LC. The discussion is followed by the author’s original Lean Culture Maturity Model in HE (LCMMHE). Within the model, the author defines seven dimensions of LC and describes them in detail on the basis of the results of the conducted research. The author reflects on the extent to which the Lean Management concept changes during the course of its implementation in HE. The adopted research perspective broadened by tools typical for the interpretative-symbolic paradigm allows the author to gain a deeper insight into LC, as well as a better understanding of its essence, dimensions, and descriptors. The author treated LC as a social construct and a metaphor of organisational culture. Davies, J. (1995). Cultural change in universities in the context of strategic and quality initiatives. In P. Tabatoni, J. Davies J., & A. Barblan, Strategic management and university’s institutional development. www.eau. Deming, W. E. (2012). Wyjście z kryzysu [Out of the crisis]. OpExBooks.pl. Emiliani, B. (2014). The language of Lean. Downloaded from https://bobemiliani.com/the-language-of-lean/. Accessed 9 July 2018. Francis, D. E., Krehbiel, T. C., & Balzer, W. K. (2017). Lean applications in higher education. Downloaded from https://the-lmj.com/2017/03/. Hines, P., Holweg, M. Rich, N. (2004). Learning to evolve. International Journal of Operations & Production Management, 24(10), 994–1011. http://www.emeraldinsight/. Accessed 15 February 2008. Maciąg, J. (2016b, November 1–3). The determining role of organizational culture in the implementation of the Lean management concept as examplified by Polish universities. Lean Conference 2016 “People, Culture and Lean in Higher Education”, University of Stirling, Scotland. Downloaded from http://www.leanhehub.ac.uk/conference/former-hosts. McNay, I. (2006). Values, principles and integrity: Academic and professional standards in higher education. Downloaded from https://www.oecd.org/site/imhe2006bis/37245044.pdf. Wilson, N. (2015). Language of lean. The Lean Management Journal. Downloaded from https://the-lmj.com/. (www3) https://www.britannica.com/topic/language. Accessed 9 July 2018. (www4) https://sjp.pwn.pl/slowniki/j%C4%99zyk.html. Accessed 9 July 2018.